Prompted by a reader’s question, I thought it would be nice to post a list of veggie places in Lima in an organized manner. We were in Lima for only a few days, mostly following the Lonely Planet guide or happycow.net, but we found a few that aren’t listed and I would like to share my opinion. Ponche (don’t order it!) The juices come in these cute jugs too. Govinda. Schell 634. A hare-krishna place snuck in admist all the fast food and tourist crap. The menu del dia is about sl.9 and is the best deal around. They have a nice outside seating, a boutique with stuff from India, really sweet desserts and homemade tofu and yogurt. They use lots of veggies and the food is good. Angelito Verde. 450 Benavides. I haven’t eaten there, but been by it on the way to Govinda. Looks average. The menu is sl. 7 and they appear to have homemade ice cream (not that you should trust signs or menus for what is actually available). Bircher Benner. Jirón Diez Canseco 487? It’s on the main street east of the park, on a second floor above a retail store. It’s really hot in there, temperature-wise and the servers are in bowties. The food is overpriced, but the menu is interesting (if they have anything available at all. the day I went there they only had the menu del dia and nothing else). The food presentation was nice, but I was not impressed with them for their price. Ucayali 212. Located right next door to villa natura. I haven’t tried it. Looks like all the other generic Peruvian vegetarian restaurants (which isn’t a bad thing). The other restaurants I’ve tried are Vida Sana and los Frutales. Both okay. Don’t get the sandwiches with one ingredient. They are really dry and bland. 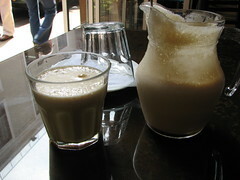 The soymilk is homemade and delicious. Lunch menus are sl.5-7. Wa Lok; Paruro 864; Chinese food, overpriced, greasy and not very flavorful. Portions are huge. Service is poor. Not very many exciting vegetarian options. Not worth it! Salon Capon; Paruro 819; recommended by my travel book, didn’t eat there but would like to. Looks like a lot of dim sum. Thanks Chantal! I didn’t make it to San Isidro while I was in Peru, but being in Lima there are SO many food options for eating out. Govinda was probably my favorite in terms of ingredients, atmosphere and price. Let me know if there’s other good restaurants to not miss out on!